Coming back at ya after a week off with a skincare routine. Sorry for the absence, I’ve been quite ill and have literally not moved from my sofa all week. Anyway, enough talk of my illness and onto all the wonderful skincare bits I’ve been using recently. I’m not going to lie, I’ve got quite the lineup for you here, so make sure you’ve got yourself a drink or a snack before you get reading haha. Lets start where you would if you were doing your nightly skincare routine, by taking your makeup off. I use one of the two products, either the Garnier Micellar Oil-Infused Cleansing Water. I bought this as I was bored of my usual micellar water, so thought I’d switch it up. I think I’ll be going back to the old stuff, this is too fragranced for me, so much so that it kinda stings my eyes when I try to get my eye makeup off. If I’m not using this, I’ll opt for the Soap & Glory Peaches and Clean Deep Cleansing Milk. This stuff is fab. It smells great, and really melts your makeup away. Once you’ve massaged it into the skin, just wipe it off with a damp cloth and voila. Personally, I like to do the whole ‘double cleanse’ thing, just to feel extra squeaky clean haha. 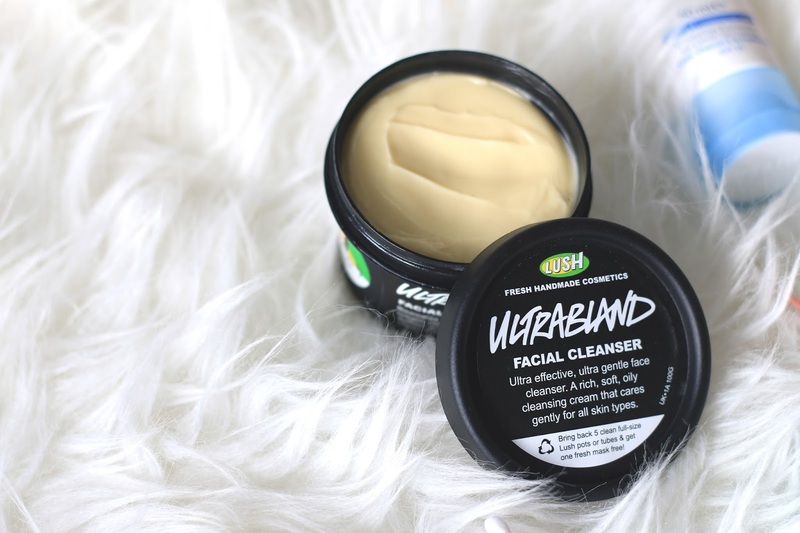 I recently bought the Lush Ultrabland Facial Cleanser, and have been loving it. Its a balm like texture, that melts into the skin leaving an oily residue that you then wipe off with a warm damp cloth/flannel. It leaves the skin feeling so soft, couldn’t recommend it enough. After cleansing, is toning. I don’t use anything too fancy for this, just the Lush Eau Roma Water, which I spritz all over my face and let it sink in. Every so often, I like to exfoliate because I have quite a few dry patches across my nose and cheeks. For this, I’ve been loving the Bee Good Honey & Camelina Facial Exfoliator. I received this in one of my Glossybox’s and have been loving it. It has a lovely scent to it and feels really gentle on the skin. Once all of thats done, its onto the serums and moisturisers. For a while now I’ve been using the Nip+Fab Glycolic Fix Serum. I have to say, I’m not sure I’ve noticed a difference in my skin but it feels really refreshing to apply nonetheless. After serum, moisturiser. I’ve nearly finished up my REN Clarimatte T-Zone Balancing Gel Cream. 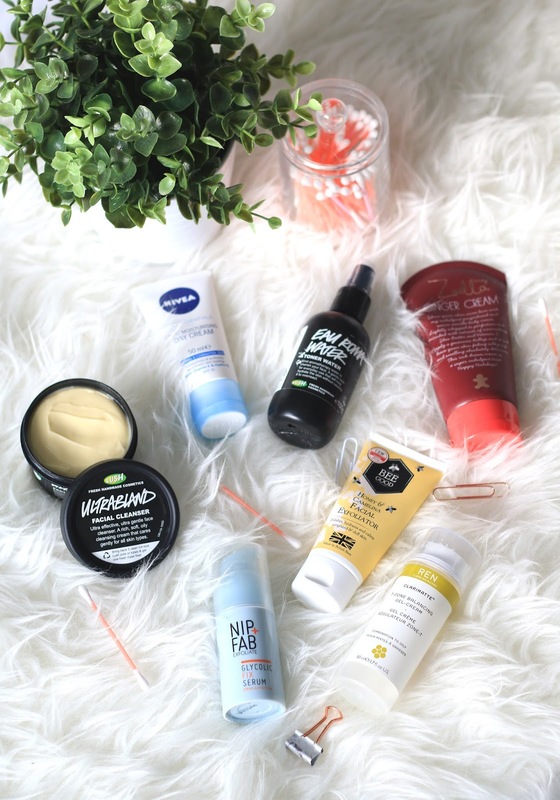 This is for oily prone skin, which I tend to have but I seem to be getting more dry areas now, so its time to change up my moisturiser I think. I love this though, as it sinks in super quickly, its lightweight and does the job perfectly. The moisturiser I use before putting my makeup on in the morning is different to my evening one, and I use the Nivea Moisturising Day Cream for normal/combination skin. This makes a great base for popping makeup on top of, and keeps the skin hydrated throughout the day. And lastly, for my body moisturiser I’ve been loving the Zoella Ginger Cream moisturiser, seems so yummy!